Bring your family together in the kitchen! For families with children ages 4-12. Taught by the award-wining FamilyCook Productions. Classes are taught in the Fulton Stall Market. Ticket availability is first-come, first served. Maximum class capacity is 24 participants. Please reserve 1 spot for each person (adults and children ages 4-12). During these FREE lively hands-on cooking classes, your family will learn nutrition fundamentals that are fun and easy to understand, basic cooking skills and tools that engage adults and children alike, and multicultural vegetarian recipes that you can make at home. Most important - you and your family will bond by preparing a delicious, seasonal meal featuring locally grown ingredients from the Fulton Stall Market's farmers and producers. Sample Ithaca's craft cider, artisan products, culinary bounty & farm-to-fork scene! Get inspired to visit this "gorges" city in the Finger Lakes Region of NY. Presented by VisitIthaca.com and EscapeMaker.com. FREE to attend for all ages! Let's celebrate the coming of fall foliage, fruiting orchards and autumnal goodness! What better way than with all things APPLE! EscapeMaker.com, New York’s premiere guide to local getaways, day trips and farm escapes, will host its 5th Annual “Applepalooza” in conjunction with Fulton Stall Market’s Sunday farmers market at Pier 16 & 17. Check back for updates on vendors, activities and more in the coming months! Bring your family together in the kitchen! For families with children ages 4-12. Taught by the award-wining FamilyCook Productions. Classes are taught in the Fulton Stall Market. Ticket availability is first-come, first served. Maximim class capacity is 24 participants. Please reserve 1 spot for each person (adults and children ages 4-12). A multi-cultural market event, celebrating the best of New York City’s Public Markets in partnership with Fulton Stall Market’s farmers and producers. 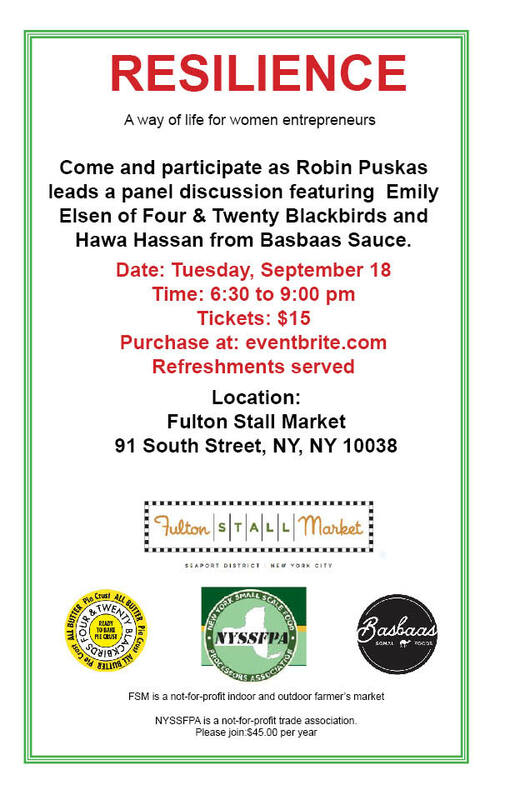 Please join us for a panel discussion on the power of resilience in small-scale food business, featuring Emily Elsen, founder of Four & Twenty Blackbirds, and Hawa Hassan, founder of Basbaas Sauce. Moderated by Robin Puskas of New York Kitchen Company. Locally sourced snacks will be served, including Basbaas Sauce and seasonal vegetables, Anthony Road Wine Co. wine, Hudson Valley Farmhouse hard cider, Om Champagne Tea kombucha, and Four & Twenty Blackbirds pie. Please purchase tickets on Eventbrite. On July 24th, sample local craft beverages and plan your family farm getaway! The South Street Seaport shoppers will get a special treat when EscapeMaker.com, New York’s guide to local getaways and farm escapes, hosts Berry Jam on Sunday, June 19th from 11am-5pm at the South Street Seaport at Water Street. The event features farmers, producers and winemakers within a striking distance of New York City. EscapeMaker will be on hand with info on how to visit farms, farm stores, breweries and wineries whether by car, bus or by Amtrak. Plus, representatives will be on hand from regional destinations with info about visiting their local areas for your next agritourism escape. The event kicks off with music, demos, free samples and all things berry. EscapeMaker opens the first ever pop up shop dedicated to local farm, winery and brewery getaways, running March 31st-April 24th within the historic Fulton Stall Market at the South Street Seaport. Presented by Amtrak, the pop up shop will feature food and beverage samples from local producers, live music, presentations by local farmers, winemakers and brewmasters and information on local vacations, where to go apple picking and visit a farm. On April 24th, sample maple syrup, microgreens, jams, pickles, honey and more, and plan your family farm getaway! Vendors Include: Beth's Farm Kitchen, Corning & Southern Finger Lakes, Crown Maple, Edible Magazine, Hilltop Hanover Farm, Indoor Organic Gardens of Poughkeepsie, Katchkie Farm, Rogowski Farm, Shelburne Farms, Vermont Cheese Council. Thanks to our sponsors AMTRAK, Edible Manhattan and The New York Apple Association. On April 17th, EscapeMaker will host a tasting showcase inside the market and spilling outside onto Front street, which will highlight local wine, cheese & more. Vendors Include: Awestruck Ciders, Breezy Hill Orchard, Brooklyn Cider House, Cabot Cheese, Catskill Food Co., Crown Maple, Dermasave Labs, Empire Brewing, Gun Hill Brewery, HV FarmHouse Cider, Mysto Mead, New Paltz Brewing, Oliver Kita Chocolates, Osprey Dominion Vineyards, Paumanok Vineyards, Prohibition Distillery, Spring Brook Farm, Northern Farm House, WhiteCliff Vineyards. On April 10th, EscapeMaker will host a tasting showcase inside the market and spilling outside onto Front street, which will highlight local craft beer, cider & more. Vendors Include: Awestruck Ciders, Black Duck Cidery, Breezy Hill Orchard, Catskill Foods, Dermasave Labs, Edible Magazine, Gun Hill Brewery, Neversink Spirits, New Paltz Brewing, Prohibition Distillery, Radiant Pig Craft Beer. The Fulton Stall Market unveiled a series of outdoor portraits of farmers and chefs captured by Francesco Mastalia, photographer, author and lecturer of photography, using the wet collodion process, a technique developed in the mid-19th century. The 17,000-mile journey through the Hudson Valley includes over 100 of its farmers and chefs.